The ninth step of the Bolon Yokte Ku, the cosmic pyramid of the Mayan civilisation, symbolises the advent of a new world, the ninth underworld, according to which the evolution of consciousness is believed to reach its highest level. On the occasion of humankind’s symbolic passage into this new underworld predicted by the Mayan calendar, De Bethune presents an exceptional 12-piece edition in tribute to the scholarly traditions of this people. Renowned for its technical and artistic innovations, the Manufacture De Bethune is building 21st century horology while remaining true to the history of science and art. 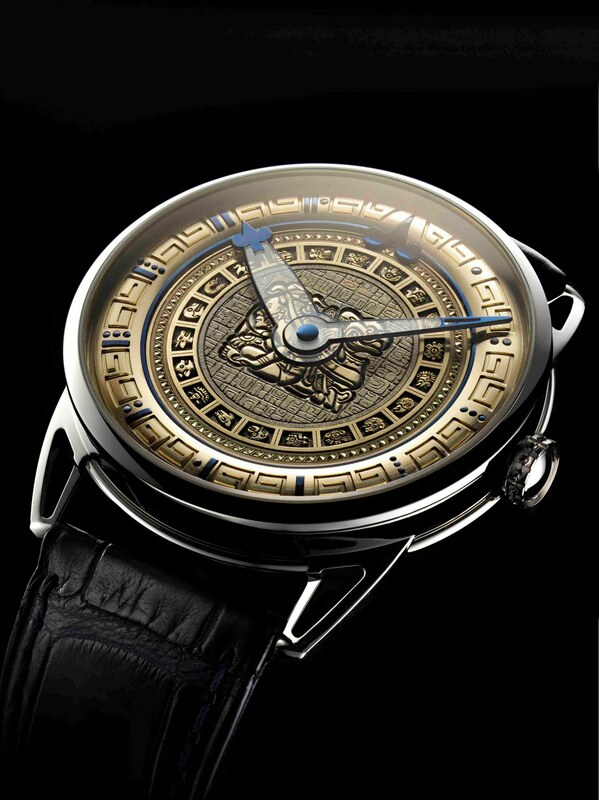 The desire to portray the epic adventure of humankind through all its many cultures represented a fascinating challenge for the De Bethune team, which has sought to recreate the deep atmosphere of the ceramics and stones sculpted by the Mayan scribes. The solid gold dial of these timepieces has been hand-engraved by Michèle Rothen, and enhanced by 31 flame-blued steel inserts. The hour circle displays the numerals of Mayan numbering system, while the inner ring presents the 20 glyphs of divinities, animals and sacred objects representing the various days of the calendar. The dial centre features the baktun, a period glyph used in particular for calculating the “Long Count” and comprising 144,000 days. In order to highlight the subtle visual equilibrium of the dial, the hands are made in sapphire rimmed with blued steel according to an exclusive De Bethune procedure. The Mayan scholarly tradition, partially re-transcribed in the manifestos or codices dealing mostly with astral sciences, testify to a strong interest and a genuine fascination for long periods, dates, and remote events both past and future. The Mayan scholars devised a sophisticated arithmetical system mainly composed of period glyphs and numerical glyphs, associated with signs and hierarchized for the “Long Count” of lengthy periods of time. With its feet firmly planted in history and its head turned to the future in building tomorrow’s watchmaking, De Bethune offers its own distinctive celebration of the mystical and scientific Mayan genius, and the symbolic advent of a new world.